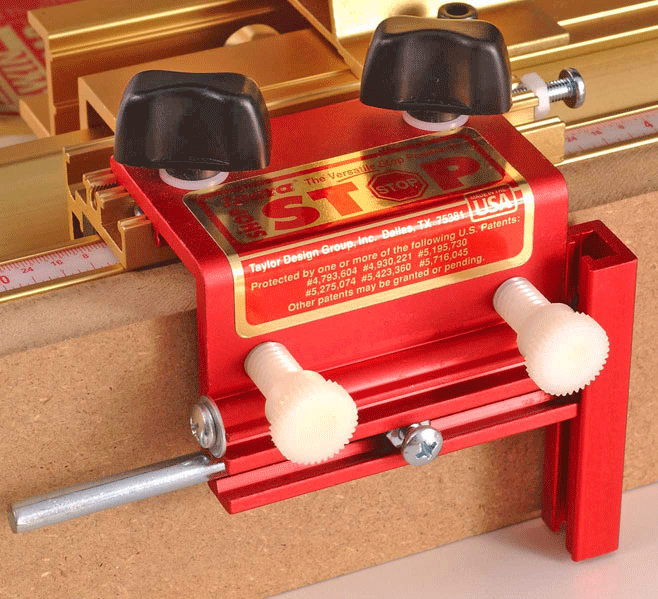 The INCRA ShopStop is our most versatile stop. The vertical stop bar is adjustable up and down, it can be reversed, and it has a screw-based micro adjust. The Shop Stop is also expandable - the top section can be slid into a second channel on the base section to make the interior wide enough to span an INCRA fence and a wooden sub fence of up to 3/4". INCRA's patented positioning mechanics make it deadly accurate and completely repeatable. 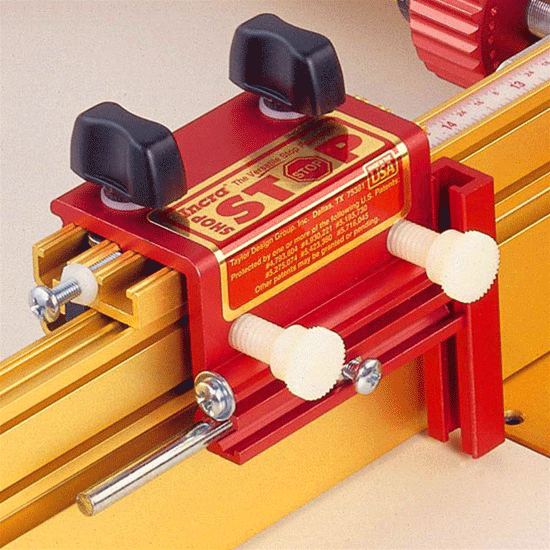 The Shop Stop works with all INCRA Router Fences that are equipped with 1/32" or 1mm incremental racks, INCRA Track Systems, and standard, "non-Flip" IncraLOCK Cut-off Miter Gauge Fences. It is NOT compatible with Flip Fences for INCRA Miter Gauges. - Expands to Accommodate Any Fence Thickness Up to 1-1/2"
- Vertically Adjustable to Accommodate Any Fence Height Up to 3-1/2"
INCRA Shop Stop - Expanded Mode INCRA ShopStop show here in EXPANDED mode with a sacrificial fence. This change only takes seconds. Simply loosen the two adjustment knobs on top and slide the T-Nut connectors out of the rear slot and into the front slot. Tighten snugly and you are ready for expanded usage with a 3/4" sacrificial fence made from any appropriate material. 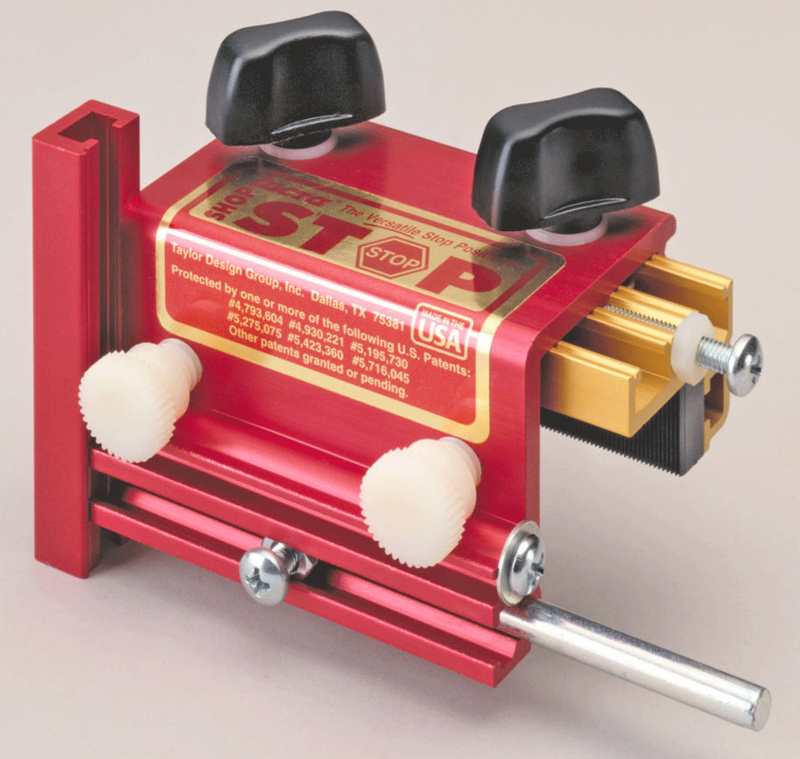 Attaches directly to the INCRA Track or any INCRA Router Fence that's equipped with 1/32" incremental positioning racks. 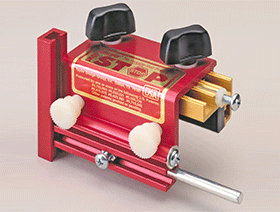 The heart of the system is the highly versatile INCRA Shop Stop. Patented Automatic Positioning Control and micro adjustability mean instant, repeatable accuracy without measuring or trial and error setups. Click to download INCRA Shop Stop Manual in PDF format.